Sterling Edge has introduced the New Curve Ball-Nose carbide insert for 3D profile milling of stainless steel and alloys including Invar, Inconel and other difficult to cut materials. We make the New Curve with a harder substrate for edge life and new state-of-the-art coating specifically designed for cutting highly abrasive materials. Customer testing has been very positive with several mold shops cutting the nickel-iron alloy Invar, saying it's the best insert they have ever used on that material. Invar is known for a uniquely low coefficient of thermal expansion within ambient temperatures, making it useful in precision scientific instruments. 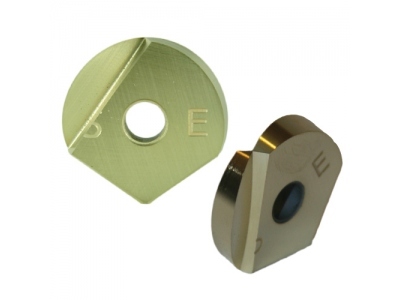 The New Curve Ball-Nose carbide insert is available in sizes 3/8" to 1-1/4" and metric 10mm to 32 mm. Sterling Edge also now makes a new carbide extension for our modular screw-on head cutters. This new extension is available in sizes 1/2", 5/8", 3/4", 1" and 1-1/4" standard, and 12mm, 18mm and 25mm metric. The length for the carbide extension ranges from 4" to 12" long. This product gives Sterling Edge customers an additional choice to the modular line that already includes Tungsten (heavy metal) and steel extensions.